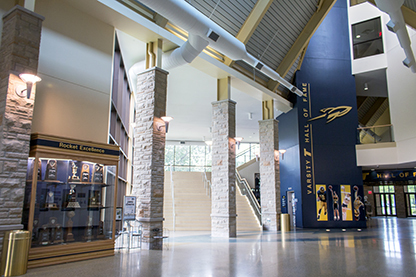 The Charles A. Sullivan Athletic Complex serves as the main entryway into Savage Arena. It is named for UT alumnus Charles "Chuck" Sullivan, whose $5 million gift in 2006 kicked off the campaign to renovate Savage Arena. Glass walls in the main entrance provide beautiful views of campus, as well as interior views of the expansive new strength and conditioning room. The entryway also features columns with finely crafted stone-work. The Fitness Center was named in honor of Charlie and Nancy Creech, longtime UT supporters who made a large gift toward its completion. The total square feet of the Fitness Center is 5,622 sq. ft., nearly four times larger than the previous weight room. There are over 30 weight-training machines in the center, with a total combined weight of approximately 6,500 pounds. 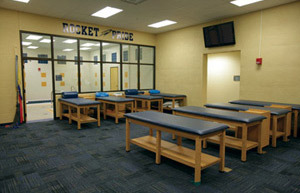 The Sports Medicine Center contains two 'state of the art' physician's exam rooms to diagnose and treat student-athletes. The UT Sports Medicine Center is 3,528 sq. ft., more than three times larger than the previous training room. The two pools in the Sports Medicine Center contain 2,850 gallons of water. 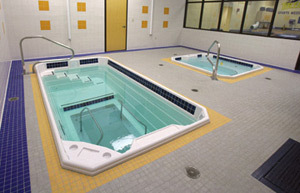 The Hydroworx therapy pool has a treadmill at the bottom that can go from 0 to 7.5 miles per hour. The Hydroworx Polar Plunge pool remains at a constant temperature of 50 degrees.